There has been a lot of finishing going on around here, in more ways than one. Last one of the season from our local spot. Boooooooo. 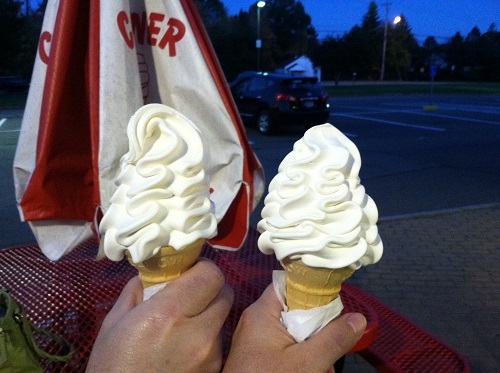 It was really yummy – simply unadorned vanilla for both of us this time. No pictures, but the finishing part of the pole building is going on. Just like knitting, the main part is done, but there’s lot of other stuff to be done before it is done done. First up was cutting up rigid foam insulation into 6″ wide sections to glue to the underside of the walls. This is so when the cement floor is poured, and the winter cold makes things expand, the cement will compress the insulation rather than lift the walls/building. I have six letters for you regarding this bit of finishing (and, let’s be honest, probably all the other bits of finishing): B.O.R.I.N.G. And it’s even more “fun” when the days are getting shorter and you are trying to get it done before the sun goes down, working in partial darkness because the cement guy was coming the next day and we wanted him to see it, only to have the guy not be able to make that next day. Whatever. Bring on the next bit: Preparing for the garage door. Then there’s the knitting finishing. Also a little boring for me, but a totally necessary part of my favorite hobby. And I figured I should really finish some projects since the NY State Sheep and Wool Festival (commonly known as “Rhinebeck” in the knitting world, since that is where it takes place, and when you say “Rhinebeck” everyone knows what you are referring to…) is coming up this weekend and there is a high likelihood that I will see/find something there that I will have to buy/start immediately. So, I turned on my audiobook – which I will tell you about soon, because I am “this close” (finger and thumb really close together) to finishing it – and decided to crank out the finishing bits of two sweaters. All sewn up with one button band done. One button band (the one with the buttonholes) and the neck left to do. Oh, and then sewing on the buttons. UGH! 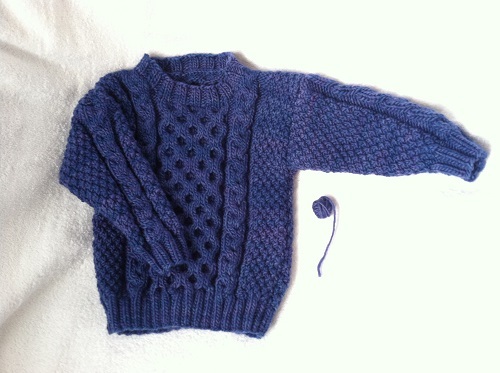 However, one of my purchase items for Rhinebeck will be buttons for this sweater. Then, maybe I’ll hire someone to sew them on for me. 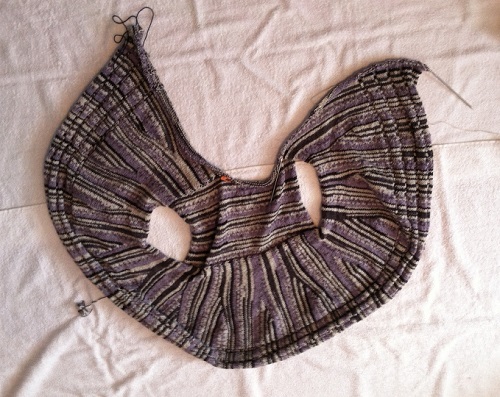 Just 12 short rows and 17 regular rows to go (if that means anything to you). Then there will be the sleeves, which will be short, so hopefully they won’t take too long. Ha! — I say that now…. Lots of things for you to look forward to on the blog in the next week or so…. a book review, a Rhinebeck re-cap, a visit to Connecticut, more finishing (maybe)…. 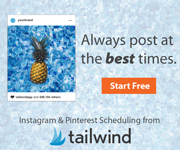 it’s probably the only blog you’re going to want to read, and share with the world. Posted in Uncategorized and tagged aaron's aran sweater, bloody mary cardigan, ecuador, pole building, rhinebeck on October 16, 2013 by lizytish. Beautiful! The Aaron Aran Sweater is beautiful, your Bloody Mary Sweater is beautiful, Equador sweater is coming along does it have sleeves to it, not sure what its gonna look like but I love the color, nice job!!! Thanks Annette! 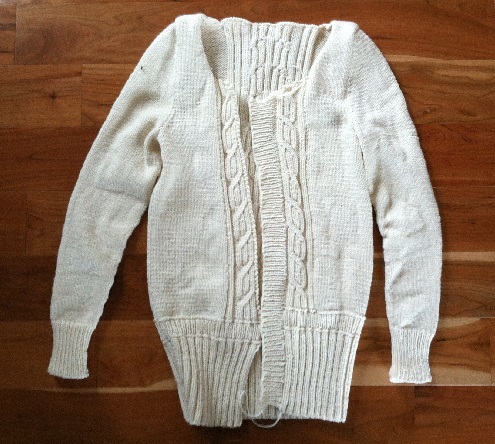 Yes, the sleeves will be next – stitches get picked up around the holes. It will sort of look like a big circle with arms sticking out of the middle!